Slowly but surely, summer is coming and we’ve got the perfect stroller accessory to make sure your little one hitching a ride doesn’t bear the brunt of the heat! We have Babyology reader Alessia to thank for bringing this little gem to our attention just in time for the warmer weather! Geleeo is the only self cooling stroller liner ever invented – no charging, no batteries, not even any refrigeration is required. Invented and designed by a parent, this is an amazing stroller accessory to help prevent children overheating in their prams. The waterproof Geleeo is made from the safest of materials and is filled with the most advanced proprietary hydrogel. It maintains a temperature several degrees cooler than its environment, perfect for keeping tots comfortable indoors and outdoors all summer long. 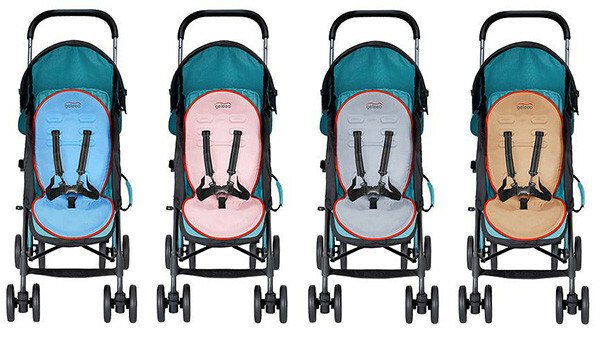 A universal shape and size designed to fit all toddler strollers, the Geleeo is available in four colours and priced $89.95. Pre-order now at Mini Monarch, Australia’s Geleeo distributor for an October delivery date, just in time for summer.